Yes, there is aluminum in paradise! This stunning and contemporary three-rail design is aluminum fence craftsmanship at its best. No wonder it's our best-selling fence! Beautifully engineered to meet the B.O.C.A pool safety code* at 54'' high, the versatile San Marino Resort™ is the perfect landscape accent for your outdoor living space. Stronger. Better Looking. More Choices. Great Advice. That's Integrity™. iNTEGRITY fence panels are made to get the job done! There are 3 types of fence panels: Standard, Xtra-Rack™, and Max-Rack™. All fence panels, in any style, are made "standard" unless otherwise specified by the customer. The standard panels of most (not all) Integrity™ fence styles can ''rack'' or adjust to conform to a slight grade slope. learn more! The availability and rackability limits of each type of panel is listed in the SPECS tab of this link. The Xtra-Rack™ or Max-Rack™ feature must be specified at time of order as this option cannot be added to previously built panels. 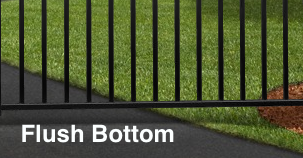 Any Integrity™ fence style can be ordered in either Classic or Flush Bottom. This option is cosmetic and does not impact the price of your fence. In certain circumstances though, a Classic Bottom configuration could necessitate a taller height in order to comply with the BOCA Pool Safety Code. Since the world is not flat, it is often necessary to install fence panels on a sloped terrain. Standard fence panels can ''rack'' or conform to a grade slope, but there are limits (which are noted in the SPECS tab of this link). There is no upcharge for Xtra-Rack™ or Max-Rack™ panels for residential and commercial grade fences. Double the number of pickets and tighten the space between them to convert any style into an iFence™ "Extreme". The Extreme™ feature makes it safer for small animals and adds a measure of privacy. The tighter picket spacing is not extended up beyond the middle horizontal rail in any three-rail design. Panels come factory-assembled as "Extreme". This optional feature cannot be later added. SuperRail™ is an upgrade that doubles up the walls of our standard horizontal rails, hiding the fasteners and adding incredible strength. It also closes off the bottom of the horizontal rails, making the panels virtually insect-free! 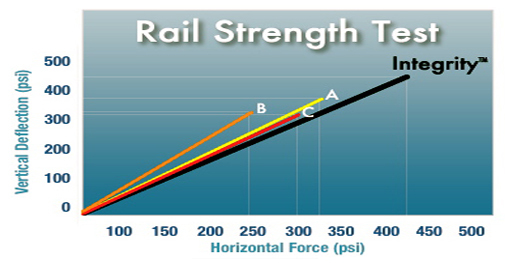 Any Integrity™ fence grade can be converted into the SuperRail™ Concealed Fastener System (CFS). learn more! This system is superior to other brands that do not use fasteners at all because stainless steel fasteners secure the vertical pickets directly to the horizontal rails. This system is the surest way to lock pickets in place and minimize fence "rattle". Powder coated to match the fence, CFS panels come factory-assembled. Non-conforming conditions are common to fencing, so while others offer only 6' wide panels in pre-determined heights, we offer you a greater variety of sizes as a better solution for real circumstances. learn more! What if a run of fence measures out to one foot longer than a multiple of 6'? Save yourself the cost of an extra post and the work involved in digging another hole by ordering one 7' wide panel to make up the distance in material. Conversely, when fencing in an area one foot less than a multiple of 6', save money by ordering one 5' wide panel and eliminate the waste! Often, just one panel needs to be taller than the rest. Or shorter. Maybe you need a gate that's made for a 50'' opening instead of a standard 48'' opening. Don't sweat it. And don't let another supplier force you into ''standards'' that don't work for your special conditions. Save time and money with No-problem™ customization! For small orders or add-on orders, you may want to save on freight charges by ordering panels as ''knock-downs.'' This means that they will be shipped unassembled using UPS or Fedex Ground services. There is no upcharge for this service, but we have a two panel per day limit per customer. On rare occasions this service may not be available for purposes of expedited shipping. Gates can be ordered single (walkway) or double (driveway), standard (straight) or arched, as depicted. These drawings are only a representation – your gate design will reflect your selected style. All Classic Collection™ gates are, by default, equipped with a Lokk-Latch, and Multi-Fit hinges, each of which is sold separately. Double (driveway) Classic gates include, by default, one standard drop rod, which is sold separately. Specify any changes at time of order because all gate frames are sized to accommodate hardware for a particular opening. Changes in hardware can often mean changes in the size of a gate frame even if the size of the opening is constant! The width of a gate is the width of the opening, not the actual width of the gate frame. priced in increments of 1'. 72'', 96'', 120'', and 144', priced in increments of 2'. Custom widths are available and cost-effective! For much wider, heavier duty gates, please see our Premier™ grade, Ultimate™ grade or Driveway Gate collections. The height of a gate is always the same as the height of fence panels ordered unless otherwise specified. Custom heights are available and cost effective! When ordering gates independent of fence panels, simply specify the desired height. 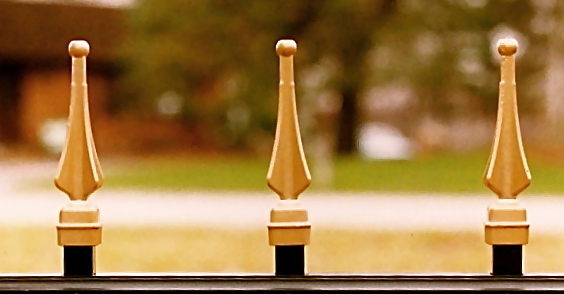 All Classic Collection™ gate posts are by default 2'' square x .125'' wall thickness, in either ends or blanks. (These same posts can be ordered with .060'' or .080'' wall thicknesses, both of which are not recommended for use with gates.) Posts can also be upgraded to 2 1/2'' square by .100'' wall thickness. 3'' or 4'' square posts are available but only as blank posts. The length of any of these posts can be of your choosing, sold in one-foot increments from 5' to 9' long. Gates and posts must be purchased separately. Custom post lengths are available and cost effective! Standard caps are always included with every post ordered unless upgraded to ball caps. It is possible to ''dress up'' just the gate on any order of fencing. For instance, you may want to order Ball Caps only for the gate frame uprights, but not the other posts on your fence order. Or, you may want to order adornments for your gate such as Butterfly Scrolls or an Estate Scroll. For wider gates, a welded U-Frame is an important option to consider. Let us help you explore the options. See Options & Accessories (Gates tab) for all of the possibilities – or call us directly, we're ready to assist! *Double gates often do not comply with local pool fence legal codes. Check local governing authorities before you order double gates for pool enclosures. These codes often vary from one community to another. If a permit is required, we recommend you obtain the permit before ordering. We will provide the specifications you need to determine compliance. Although iFenceUSA™ would love to be current on local codes for your convenience, there are simply too many. Therefore, we will not be accountable for orders that are subsequently deemed noncompliant. Relax! We'll help you determine your final material list! The information below is provided to inform, not overwhelm. We want you to know that our products are versatile and options are available to accommodate a wide range of circumstances and/or preferences! We'll always be at your side to help you order what you will need. Integrity™ Aluminum fence posts are available in five standard types. All types of posts are available in various lengths. Don't worry, we will help you determine what types and how many you will need should you place an order. You do not need to have an exact list to get a preliminary quote on your project! Every post we sell come with standard caps included. Always. These caps are not factory installed and can be purchased separately at any time if replacements are needed. All of our standard Integrity™ colors are available in each of the following post sizes: 2" square, 2 1/2'' square, 3'' square and 4'' square. Though not shown here, the symbol of Integrity™ will appear atop the caps. This is a decorative way to cap any post, regardless of its dimensions. Ball Caps can be purchased for all posts on an order or just some of them. learn more! When a standard cap is upgraded to a ball cap the post comes with just the ball cap, not both caps. Ball caps are not factory installed and can be purchased separately at any time, even to adorn existing Integrity Aluminum Products™ fences. They are available in our standard Integrity™ colors, or in gold. When it isn't possible to "sink" a post into the ground, and you need the most durable post-to-surface attachment we offer, order welded aluminum flanges. Factory-welded then powder coated in one of our standard colors, these flanges are ideal for mounting to hard surfaces such as concrete. learn more! For best results, surface area should be level. Screws to mount to the surface are not included (since applications can vary). Unless otherwise specified, post with welded flange will be cut 3'' longer than the height of your fence. This allows one inch from the top of the fence to the top of the post and two inches from the bottom of the fence to the flange itself. For instance, a 48'' high fence to be installed using posts with welded flanges will have posts cut to 51''. All welded flanges are 3/8'' thick and have four pre-drilled holes for screws (one in each corner). For 2'' square posts order 4'' square flanges and for 2 1/2" posts order 6'' square flanges. All posts are welded centered on the flange unless customized (see custom fences). Available in all standard Integrity™ colors, welded flanges do not include screws to mount to the surface (since applications can vary). Conceal a flange, cover the core hole or just trim the base of your post with a post skirt! Just slip it on in seconds before the panel is attached. Skirts are available for both 2'' square and 2 1/2'' square posts in all of our standard Integrity™ colors. Conceal a flange, cover the core hole or just trim the base of your post with a post skirt! Can be added to the base of a post at any time – even after the panel is in place. Skirts are available for both 2'' square and 2 1/2'' square posts in all of our standard Integrity™ colors. Use this two-piece flange for surface attachment of 2'' or 2 1/2'' square posts. The flange is wedged into the base of the post and the internal bolt is tightened until the flange is affixed. learn more! This post-to-surface mounting attachment is not recommended for any fence exceeding 48'' in height (use welded flanges for heights over 48''). Wedge flanges are not factory-installed, can be ordered separately and do not include screws to mount to the surface (since applications can vary). 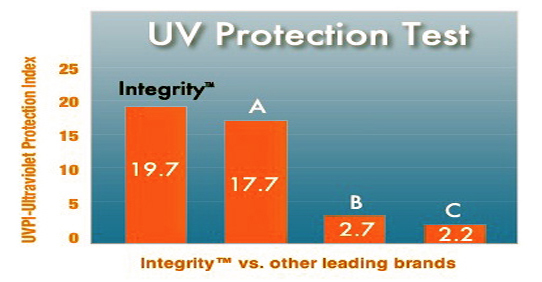 Available in any of our standard Integrity™ colors. All posts for our residential grade fence panels feature 2'' square with two grades of wall thickness (.080'' and .125''). These posts can be upgraded to 2 1/2'' square (available only in .100'' wall thickness). Upgrade to 2 1/2'' square posts for the entire project, or if you like, just for the the gates, but this option must be specified at the time of order. Endless Attachments can make installations a breeze! Mounting fences to brick, wood or concrete surfaces is easy with our Endless™ line of attachment brackets. Uniquely designed, these attachments are available in every grade and color in stationary, horizontally-adjustable, and vertically-adjustable wall mounts, as well as attractive floor flanges for posts. This is what you need when a fence panel is being attached directly to a structure such as a pillar or building without the use of a punched post. When necessary, though, they can also be attached to posts. These brackets are available in sizes to fit the horizontal railing of any Integrity™ fence grade. Stationary rail mounting brackets are used for ''straight-on'' attachments. learn more! Angled attachments require adjustable rail mounting brackets (see below). Rail mounting brackets are sold separately in any of our standard Integrity™ colors. Please specify color, type and grade when ordering. For sharp (left-to-right) 45 degree angled turns, these horizontally adjustable brackets make it easy to mount standard fence panels to Integrity™ fence posts or structures such as pillars or buildings. These brackets are available to fit the railing of any Integrity™ fence grade and sold separately in any of our standard Integrity™ colors. Please specify color and grade when ordering. For significant (up-and-down) slopes, these vertically adjustable brackets make it easy to mount Integrity™ Xtra-Rack™ or Max-Rack™ fence panels to blank (not pre-punched) fence posts or structures such as pillars or buildings. These brackets are available to fit the railing of any Integrity™ fence grade and sold separately in any of our standard Integrity™ colors. it isn't possible to "sink" a post into the ground, and you need the most durable post-to-surface attachment we offer, order welded aluminum flanges. Factory-welded then powder coated in one of our standard colors, these flanges are ideal for mounting to hard surfaces such as concrete. learn more! Order a can of touch up paint in any of our standard Integrty™ colors! 11 oz., must be shipped ground. Custom Width or Height Panels and Gates: Available and cost-effective! Gate Frame: Welded construction with 2'' square uprights! Example, if you need 20 panels and you have an area of 12' which has a slope, purchase 18 standard panels and 2 "rackable" panels, Xtra-Rack™ or Max-Rack™, depending on the severity of the slope. *Before ordering, we urge you to check local governing authority regarding pool fence legal codes. These codes often vary from one community to another, and may even vary from B.O.C.A. standards. If a permit is required, we recommend you obtain the permit before ordering your fence. We will provide the specifications you need to determine compliance. Although iFenceUSA™ would love to be current on local codes for your convenience, there are simply too many. Therefore, we will not be accountable for orders that are subsequently deemed noncompliant. This easy-to-follow short worksheet is all that is needed for us to prepare a detailed quote for you! In the quote, we will include welded flange plates with skirt covers for every post. Classic Residential Resort (Pool Safe) Designer Residential Premier Commercial-1 Ultimate Commercial-2 What's this? Please contact us if you have other requirements. Orders leave the factory within 2 weeks! We send out FREE samples! We also want to send you a brochure! We follow the Golden Rule! We genuinely care about you and your project! We will go the extra mile to help you succeed! We're always here to answer questions, even on weekends! "Just wanted to send a note regarding "the pool fence", which my two sons and son in law completed on Sunday. Despite the rain, they got it done in a day and 1/2. My wife is thrilled with the final result. Thanks again for your excellent support."